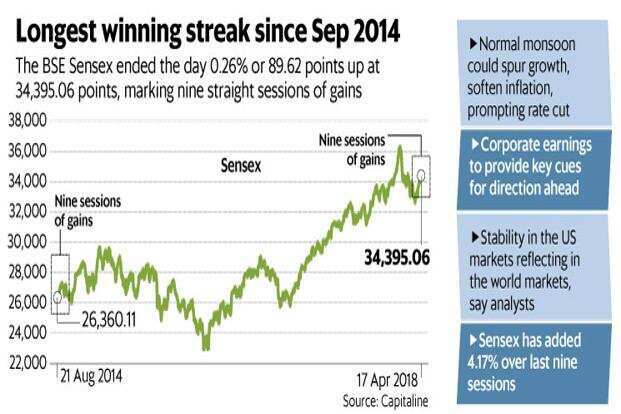 Mumbai: Benchmark equity index Sensex rose for the ninth straight session on Tuesday, its longest climb since September 2014, thanks to stable world markets and forecast of a third consecutive normal monsoon. Markets are likely to take cues from ongoing March quarter corporate earnings in the days to come as investors check for evidence that they are on a recovery path. BSE’s 30-share Sensex closed 0.26% or 89.62 points higher at 34,395.06 points, while National Stock Exchange’s 50-share Nifty climbed 0.19% or 20.35 points higher to close at 10,548.70 points. It was the highest close for Sensex and Nifty since 26 February and 27 February respectively. The gains in this rally have been slow and steady as Sensex and Nifty added 4.17% and 4.15% respectively over last nine sessions. They are still 5.62% and 5.58% away respectively, from their respective record high levels seen on 29 January. “Basically, there is stability in the US markets and that is reflecting on the world markets," " said Hemang Jani, senior vice-president, advisory, at brokerage Sharekhan, owned by BNP Paribas SA. “The good monsoon forecast is a big positive too, as it would be the third consecutive year of good rains," added Jani. Rainfall is likely to be normal during the June-to-September southwest monsoon season, the official weather office said on Monday. A good monsoon is crucial for India’s economic growth, and could also bring down inflation, prompting the Reserve Bank of India (RBI) to cut interest rates. In a note on Tuesday, Bank of America-Merrill Lynch (BofA-ML) said it grew more confident of its call of a 25 basis-points RBI rate cut on 1 August after the monsoon forecast. “Despite a relatively poor summer rabi crop, this should contain agflation in 2H18, by watering a good autumn kharif harvest," BofA-ML said in the note. “Good rains are likely to give the RBI MPC (monetary policy committee) greater confidence to ease looking through the jump in inflation to 5.4% in June on base effects," BofA-ML added. Foreign institutional investors or FIIs have been buyers of nearly $2 billion of Indian shares for the year to date, but have sold a net of $140.92 million of the asset class this month. Domestic institutional investors or DIIs have been net buyers in each month of 2018, infusing a net of Rs28,352.26 crore into Indian equities so far. Corporate earnings for the March quarter have just started to trickle in, and are closely watched for evidence of concrete recovery. “Expectations are very high as we enter the earnings season. I believe the quarterly numbers will be good, but the upmove may not necessarily continue the same way," said Jani of Sharekhan. “We may see some consolidation coming in after a rally, and the stocks should look up again as well," he added.